I had the pleasure of speaking with business attorney, speaker and author Matthew Neill Davis. His firm, Davis Law, is a Law Firm 500 company that specializes in preventative measures, and helps business owners proactively solve business and legal problems. Davis also heads custom legal departments at corporations, small businesses, and nonprofits. 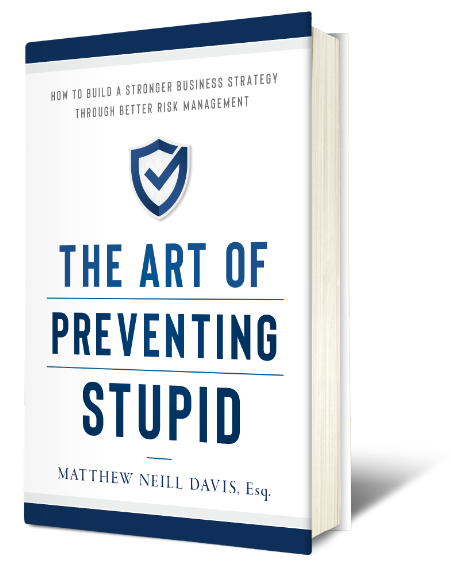 His new book is The Art of Preventing Stupid: How to Build a Stronger Business Strategy Through Better Risk Management (An Inc. Original, April 2, 2019). 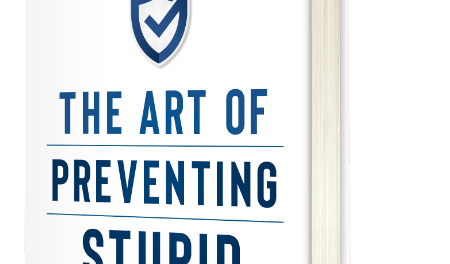 Talk about the title: What exactly do you mean by preventing stupid? A basic premise of my book is that the vast majority of our business problems are self-inflicted. We fail to prepare for catastrophes, don’t acquire the needed skillsets to meet our goals, or slack off on tasks that need to be accomplished. All three of these kinds of problems can be managed, particularly with the Business Immune System set out in the book. I maintain that not dealing with problems that we can foresee if just plain stupid — and I’ve outlined an efficient, effective and comprehensive method for getting ahead of them. Did your own experience as a business attorney prompt you to want to write this book? Yes: I am an attorney, but more importantly I am descended from dirt-scratching Oklahoma and Kansas farmers who encouraged their kids to get off the farm and go build businesses. Given that heritage, I know that having a successful business can make a huge difference in a family’s future. I had the privilege of practicing law for over twenty years in my hometown, and repeatedly saw the damage that bad business decisions had on my clients’ futures. Most of the time, when someone came in with a problem, my initial reaction was that this could have been easily prevented. What are the three essential kinds of problems that businesses face? All of our business problems come from catastrophes, ignorance or ineptitude. You can narrow down all the problems businesses have into those three categories. This is a critical realization because it provides the basis for reverse engineering — or perhaps more appropriately, “prior engineering” — problems before they develop. Part of the trick is seeing that our problems are a function of our goals. Problems are just the flip side of goals. Once you set goals, the obstacles define themselves. Then knowing that these obstacles come in only three forms, you can start to ask the right questions to wire around them. Explain the Business Immune System: how does that work and how does it help businesses stay afloat? The Business Immune System Report sets out a 21-point analysis that comprehensively examines the potential problems a business might face. We use it as a report card and run it for the businesses that we serve as general counsel for quarterly review meetings. We make poster-sized versions that some people keep on their walls to see where we agreed they got an “F.” It’s a painful reminder to fix the problem. All three sources of problems have “fixes.” For catastrophes it is preparation — either to ward the problem off entirely or, if that is not possible, to prepare for it. The solution to ignorance is simply education — with the internet, the resources are at our fingertips so it’s pretty inexcusable to stay ignorant. Ineptitude is generally controlled with systems and improved management. The bottom line is that the Business Immune System Report helps protect businesses the same way a body’s immune system does, keeping illness at bay. Talk about disasters. For instance the bomb cyclone that hit Nebraska — how could farmers have prepared for this? I am very aware of this disaster. My cousins still live just down the Missouri River and run the family faming operation that started in 1852, before the Civil War! I’ve been watching the news about the flooding and was just talking to a lawyer in Omaha who said several important bridges there are gone. I separate natural and human disasters. For the former, I maintain that they are predictable: this sort of thing happens all the time. So as far as preparation for the floods this rainfall produced, crop and property insurance is about all you can do. Really this is no different than a trucking business needing to have good insurance for accidents. With drivers out on the road, accidents are going to happen. Insurance is a very common “cure” for the sort of catastrophes we cannot prevent. You talk about the difference between an owner’s ignorance and her employees’ ignorance — what’s the difference? Let’s consider owners and upper management as one and the same. That said, the skill-sets they need are vastly different from the skill-sets of employees doing the production. I like to break management functions down into six essential departments: admin, operations, HR, legal, marketing and sales, and finance. Businesses need a good team on all of those fronts. Granted, frequently legal and HR are on the sidelines in smaller companies. If we look at lower-level employees, their main job tends to be turning out the product or service efficiently and consistently. Are there instances where companies failed based on only one kind of business problem? And why, even if everything else was working well, did the company fail anyway? Absolutely. Just one bad problem can kill a business. We had a prospective client who was very dependent on Google Pay Per Click for his leads. He did not have a click limit set with Google, so every time someone clicked on it he would be charged. Then he rather unceremoniously dumped his girlfriend — who was aware of his reliance on pay per click. She and her friends just started clicking away on his ads and by the time he figured it out, he owed Google about $20,000 — which he could not pay. Google turned off his access and his business died. All of this could have been easily prevented if he had just made a set spend with Google. How often should business owners check the health of their business? We like to do it quarterly. That rhythm allows enough time to make significant changes or fixes. It also usually gives time for new potential problems to develop as the business grows and changes. To learn more, visit matthewneilldavis.com.